Meditation retreats in BC, Canada. Balanced & supportive schedule. 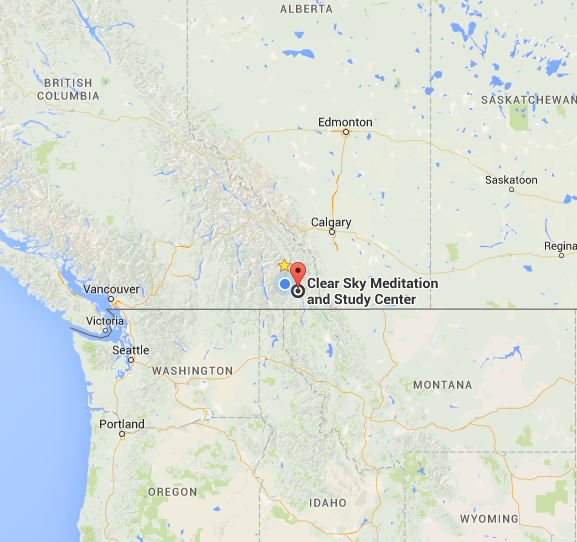 Choose a quality meditation experience at Clear Sky, a meditation retreat center in BC, Canada. In our solo cabins, you’ll find the ideal conditions to enjoy the fruits of your personal silent retreat. Who thrives best on our personal meditation retreats? We specialize in offering quality personal, solitary retreats for people with meditation experience who want the support to take their practice to a deeper level. Our retreats include some mindful activity, which most retreatants find supportive to their formal practice. “How would I describe my 5-day ‘silent’ retreat at Clear Sky? In a word: Healing. My days started off with a 7am group meditation with the retreat organizers. The group energy was both very grounding and vibrant – and I quickly felt a deep sense of connection and peace in their company. I ate in silence three meals a day – the delicious food made it easier (but not easy!) to bring my wandering mind back to the pleasure of the wholesome offering. Twice a day I participated in ‘Karma Yoga’ which essentially means doing some chores in silence (I loved stacking wood, and making kindling). This activity offered me the opportunity to maintain a sense of awareness while being in the world, and watching the thoughts and emotions that come up. These duties added structure to the day – though I did sleeping a lot for the first couple of days. OPTION 1) Practice and Integrate – for people who have or are trying to re-establish a regular meditation practice, can sit in meditation for 20 minutes or longer several times a day, and would like some structure and routine to support their meditation retreat. The minimum stay is two nights. You may find this a good alternative to doing a Vipassana retreat, which requires many hours each day of formal meditation and often a commitment of 10 days. Come for a weekend retreat or longer. This option includes three hours of mindful activity, such as weeding, berry-picking, or firewood collection. OPTION 2) Just Practice – our full immersion package, reserved for people with a solid background of meditation retreat work already under their belt. What if I’m new to meditating? We love that you’re discovering the benefits of meditation. Our solo retreats won’t serve you well unless you’re comfortable meditating for at least 20 minutes regularly, with minimal support. Yet, we’re not aiming to exclude anyone who is indeed ready for a retreat. So, if you’ve been sitting regularly for at least six months, as an example, our Practice and Integrate retreat would most likely be good for you. If you’ve never meditated before or are just beginning, however, you may not be ready for a cabin retreat with us. We suggest instead connecting with local groups near you, as a first step and then consider a weekend retreat with us. Here are some local groups connected to us. We’re developing more ways to support people earlier in their spiritual practice, including online guided meditations and online courses. If you’re looking for a more immersive experience that would include some meditation instruction, check out our Karma Yoga Program. The well-being of our personal retreatants is something that really matters to us. We know this is something we’re very good at – providing the container for your practice to flourish. You’ll receive a warm welcome and full orientation when you arrive; we’ll get to know your individual needs, such as how you take your coffee or tea in the morning. During your stay, you’ll enjoy three delicious local or organic meals a day, served to you in a separate eating area. Video: What’s it like at Clear Sky? The Practice and Integrate daily schedule includes personal practice time, three hours of Karma Yoga (see more below), three meals served to you in silence, and private accommodation. There may be the option to join group meditations (see schedule), depending on the onsite schedule. Click the link below to open a PDF schedule showing your arrival day, departure day, and full days in retreat. In the past, when people booked a few days’ or a week’s personal retreat time with us, they would often find that having all day in formal meditation wasn’t actually what they wanted. They would struggle, suddenly trying to make the shift to meditating for eight to fifteen hours a day. Even with the conducive environment of the centre, then, it was clear that retreatants would benefit from a more supportive structure and routine to build the energy and focus for fruitful meditations. To remedy this, we now inlcude three hours of Karma Yoga (mindful service, or meditation in action) into the schedule. We also know that many things, including personal retreats, are easier to do with the support of others. With this in mind, we now provide a daily check-in with a mentor. With these changes, things have worked much better for retreatants. Focused physical activity increases energy and focus in formal meditation. Since formal meditation styles also includes walking, Karma Yoga can also be thought of as an extension of walking meditation. While performing tasks and moving, we experience our inner chatter and pay non-judgmental attention to the mind and body. This activity is closer to our daily lives, and helps us better integrate the meditative mind when out of retreat. Read more about how this works in this blog from February 2018. Our cabins Arrakis, Lyra, and Vega overlook a valley of pines and grasslands and offer stunning views to nourish the work of meditators in retreat. We designed them to provide solitude and spacious beauty in a prime location on the property. Explore the varied geography of the property using our trails and outdoor meditation platforms, or retreat close to your accommodation. Please note: Our beautifully located back-to-nature cabins are designed to minimize the opportunities for distraction and do not have electricity or plumbing. They are heated by small wood-powered furnaces and lit by battery-powered lanterns, which we provide. You’ll have access to electricity, full washroom and laundry facilities just a few minutes walk from your cabin at the main facility where your meals are also served. For general information about staying with us, see this page. As one of our personal retreatants, you’ll be looked after well. Our kitchen consistently pleases the stomachs of everyone who comes to stay. Enjoy fresh and organic produce, prepared mindfully and served to you. We serve an omnivore diet, and we can adjust for dietary needs such as for allergy, gluten-free, and vegetarian requests. If you have dietary requests that may require extra levels of care and attention, please make this clear in your booking, or fill in an inquiry form to ensure we can accommodate you. Checking in with an experienced meditator serves as a tuning fork. It will help you keep on track, deepening your experience and giving you courage, strength, and motivation to get back on track. As hosts, we care about how people in silent retreat are doing. In the spirit of our tradition, guidance is offered by the principle of dana (similar to “pay from the heart”), which is a practice of generosity. You can read more about the mentoring in the FAQ section below. See below for rates and FAQ. We offer the Just Practice package for people who already have a strong practice, have done meditation retreats before, and know they can keep focused for eight hours or more a day without much guidance. The Just Practice package includes one hour of Karma Yoga, or mindful service, the cornerstone of our practice here at Clear Sky. There is a premium of an extra $CAD 21 per day for this package in recognition that your stay is fully supported by others doing Karma Yoga, allowing you to focus on your meditation. Please contact us before booking a Just Practice retreat, unless you are already known to us as a member or have done long retreats with us before. Click here to view the schedule for this retreat. Are your personal retreats suitable for beginners? Not currently. We specialize in providing retreat space for people who have, or are trying to re-establish a regular meditation practice. As a guideline, we ask that you are used to sitting for 30 minutes or longer for several periods a day - and this is a guideline, not meant to eliminate someone who is ready for a retreats. Also, please read the section on the main page entitled "What if I'm new to meditating"
Where is Clear Sky located? We're in the East Kootenays B.C., Canada, an hour from the US border and four hours from Calgary by car. The nearest town is Cranbrook, and we are 40 minutes from the Canadian Rockies International Airport. Click here to see a map of our location. What does the "mentoring" for Practice and Integrate look like? The mentoring is given freely by a Clear Sky resident or senior student, and follows the practice of dana which may be paid on registration or when onsite. What are some common Karma Yoga tasks that I'll be asked to do during my retreat? "Before enlightenment; chop wood, carry water. After enlightenment; chop wood, carry water." There's really nowhere to get to. In formal meditation, we're paying close attention to what's going on, right now - we're not trying to get somewhere. We're not trying to teach a goal. Doing Karma Yoga is a great way to learn this lesson, in action, with simple mindfulness to what we're doing and nothing more. Do you have more information about getting to and staying at Clear Sky? or fill out the form below to inquire about availability.